Please note that the above slideshow is automatically created by searching Flickr and does not contain manually curated images. 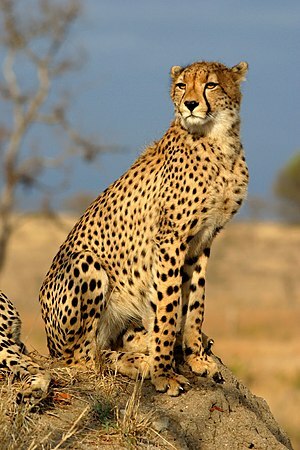 Hence, it is likely that some images may not be of Acinonyx jubatus. Carnivora The diverse order Carnivora (pronounced /kɑrˈnɪvərə/ or sometimes /ˌkɑrnɪˈvɔərə/; from Latin carō (stem carn-) "flesh", + vorāre "to devour") includes over 13 distinct families and over 260 species of placental mammals. Its members are formally referred to as carnivorans, while the word "carnivore" (often popularly applied to members of this group) can refer to any meat-eating animal. Carnivorans are the most diverse in size of any mammalian order, ranging from the least weasel (Mustela nivalis), at as little as 25 grams and 11 centimetres, to the polar bear (Ursus maritimus), which can weigh up to 1,000 kilograms, to the southern elephant seal (Mirounga leonina), whose adult males weigh up to 5,000 kilograms and measure up to 6.9 metres in length. Carnivorans apparently evolved in North America out of members of the family Miacidae (miacids) about 42 million years ago in the Eocene era. They soon split into cat-like and dog-like forms (Feliformia (cat-like) and Caniformia (dog-like)). Carnivorans are primarily terrestrial and usually have strong sharp claws, with never fewer than four toes on each foot, and well-developed, prominent canine teeth, cheek teeth (premolars and molars) that generally have cutting edges. The teeth structure and the skull architectures of Carnivores are among their distibguishing features. Members of Carnivora have diverse food habits, although many are primarily carnivorous, and carnivory is widely distributed in mammals, being found in many other orders including Chiroptera, Metatheria, Primates, and Cetacea. This page was last modified on 9 February 2011, at 20:59.